James Schergen is one of the most famous celebrity on the internet when it comes to Chinese Tea. He appears on his own videos and his articles appear frequently on teadb.org (link). He had recently written to me giving his insight on my previous blog post about Chinese teapots (read my 2 latest posts). I had given much thought and I decided to reply to him in a 'letter'. Thank you so much for your thoughts about my Chinese teapot blog entry. I am a big fan of your work and I tune in regularly to watch your tea videos. I imagined myself literally sitting across the table while you are brewing and sampling the tea. Sometimes, I shout out loud at the video to call you to reheat the water for your later infusions as cooler water might affect the interpretation of the tea. It was in good fun. I did hear on the grapevine that there is a possibility that you may coming to our shores. I am so happy and I hope to see you and get you to sign autographs.....so I can sell them later to the many tea auntie fans that simply adore you and may even camp overnight at the airport to welcome you if you are really coming. "Can a serious tea drinking person be into tea without owning teapots? This is a harder question, but I do think it is possible." I actually was dumbfounded for several days. In my tea drinking groups which I join in Singapore, Malaysia, Hong Kong and Guangzhou, we often discuss many things about tea and tea ware. We would also debate on tea issues like storage but never whether a serious tea drinker can do without teapots. You had suggested that owning a teapot is a luxury than a 100% requirement. "I realized today I haven’t touched any of my gaiwans since I returned from Taiwan. I remember I used to use the gaiwan for everything…. from greens to blacks. Gaiwan was my weapon of choice. Gaiwan was the only thing I’d use, pretty much. Then slowly, I started using more yixing pots. I gradually bought a few more, and found them, somehow, easier to use. Maybe it’s because I will no longer burn my fingers, as I do once in a while with a gaiwan. Maybe they provide more aesthetic variety. Maybe they do make better tea? On the better tea question, I am now quite certain that some yixing pots will make softer tea (whether that’s better or not is up to individual taste). I’m still not sure exactly what goes on in a yixing pot that actually changes the tea. There are many theories out there, from temperature retention (sort of true…) to pores in the clay (really depends) to seasoning (maybe true, maybe magic…. and also depends, greatly). Gaiwans, though, still give you an “honest” tea, without really messing with the tea in any particular way. " Is Marshaln a serious tea drinker? Yes! He is the master sifu of tea. He had invited me once to his palace and his collection of teapots he use for brewing tea is pretty impressive. 2. During one of my tea drinking sessions in Guangzhou a few years ago. 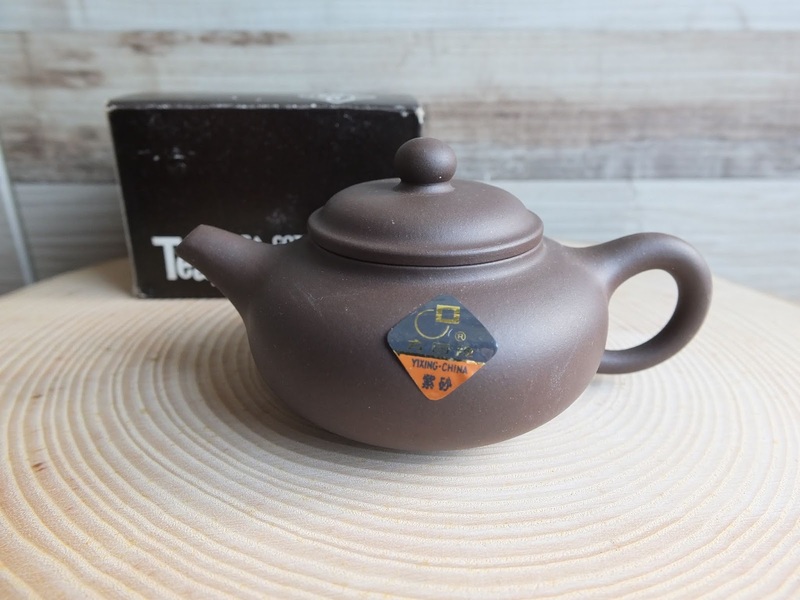 A retired manager of CNNP who was in this tea drinking group had remarked that the invention of the Yixing teapot was one of the best things for Chinese tea. I find that his thoughts are appropriate in this discussion. 3. I spent last Tuesday morning at a local teashop in Chinatown and I posed this teapot question to the manager there. Instead of answering my question, the manager asked me to sample an old shui hsien with her. The manager used a gaiwan and a teapot to brew the oolong (see bottom pix) and we proceeded to sample the tea. Tea brewed from the gaiwan seems more aromatic while the tea from the teapot was very smooth in the taste and finish. Personally, I use teapots to brew my tea at home. I have a few gaiwans and hardly use them. Many serious tea drinkers I know use a teapot than a gaiwan. I do not see a teapot as a luxury. I had also noticed that the gaiwans used for tea sampling at teashops tend to be better quality gaiwans. Many believed that the older gaiwans made in the 90s or earlier are very suitable for sampling tea. Maybe it is the glaze or the quality of the raw material. These gaiwans can be expensive and asking prices for these old gaiwans can be a few hundred dollars each. You mentioned that 'good Yixing can improve' a tea session. However, I interpret your argument that you find that this improvement or difference as not significant or dramatic enough to warrant that; using a Yixing teapot is 100% necessary. I respect your view even though I disagree with it. Do look out for me at the airport, if you are coming to our shores, as I will be standing with your hoard of screaming auntie fans to welcome your arrival. It will be a dream meet for me. Can a serious tea drinking person be into tea without owning teapots? Tea celebrity James of TeaDB commented on my previous blog entry and his comments are reproduced in full below. I shall give my reply in another blog. Thank you, James for your thought provoking comments. I think you referenced one of my recent posts. I think we mainly agree about most of this. But in regards to the importance of teapots, I'd respectfully share a few of my thoughts and push back a little bit. In my opinion, good Yixing can improve a session. I also use Yixing for a significant majority of my own sessions so I'm certainly not a total skeptic. I also do believe that it's importance can be overly inflated. My post was written towards people newish to Chinese tea and/or pu'erh. The cost of good clay pots can be quite high and getting a $200 teapot is often seen as a significant barrier towards trying Chinese tea, when I think it'd be better if it wasn't. From what I've seen, a fair number of people just starting will end up with cheap pots that they'll stop using at some point. You could argue this is necessary just as tuition tea is.. But.. I'd argue newer people would be better off focusing more on tea rather than concerning themselves with the intricacies of the teaware market. Can a serious tea drinking person be into tea without owning teapots? This is a harder question, but I do think it is possible. I have a good tea friend that's been into tea for several years.. They have a couple pots, but when resources are limited he just about always ends up buying tea. Having old, nice pots is a nice thing to have but I also don't think it is a 100% requirement to be considered a serious tea person. I'd argue it is a luxury more than a 100% requirement. I have mentioned on many occasions that there are inexpensive ways (or things I did) that had improved my puerh tea brewing sessions while I was brewing tea at home. The following ideas or methods are not expensive to do and I would like to share (repeat) these ideas again in this blog entry. The improvements might be very very tiny, hardly noticeable but can be discerned by a pu erh tea drinker. 1. Water. I use tap water for my tea. Chlorine was added to the water (during purification) to make it germ free. The chlorine scent is quite pronounced especially when you fill a jar, cover it and returning to it 15-20 min later. I use a filter (simple gravity type) to remove this smell. Another way to remove chlorine is to fill a jar of water and leave it overnight. Drinking chlorine free water does improve the taste and aroma of the pu erh tea. I know a few tea friends that went the extra 'mile' by placing mineral stones or charcoal pieces in the water jar. Another inexpensive method is to use boiling water for brewing all your pu erh infusions - raw or ripe. Even for later infusions, start up your stove again or let the kettle reboil before brewing your tea. I feel that I could get a wider aroma profile from just using boiling water. Ideally, if you can get a kettle of water and get it to slowly simmer (low boil) throughout the tea session...is best. I am sure you had noticed some friends, teashops or even video where the water is never reboiled after the 1st infusion and the water gets 'cooler' with subsequent brews.....the tea taste and aroma is affected by the lower temperatures and the interpretation of the tea in my opinion is compromised. Reboiling a hot kettle of water only take a few seconds and your tea would taste better with this extra effort. 2. Use a Yixing teapot to brew your tea. 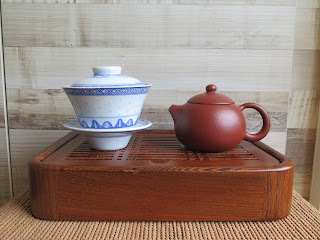 There is a big difference between using a gaiwan and a Yixing teapot when it comes to brewing pu erh tea. 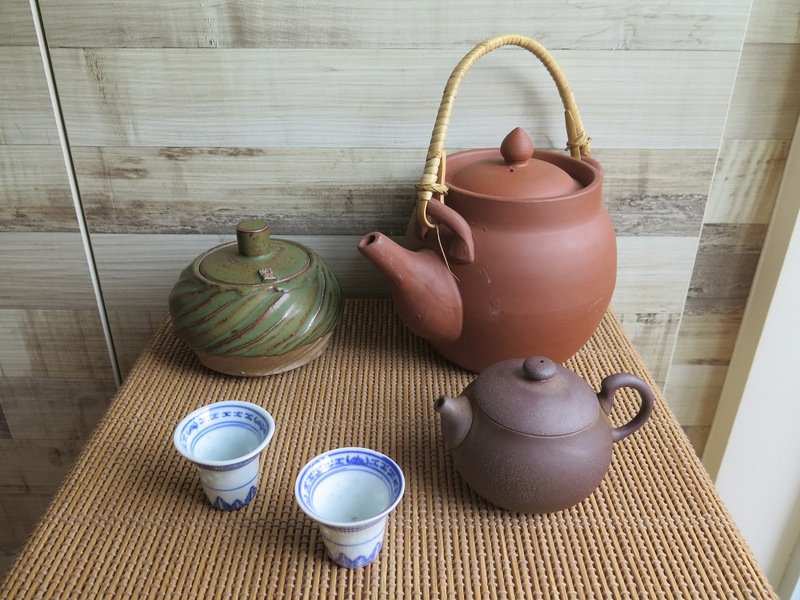 A Yixing clay teapot will enhance the taste and aroma of your pu erh tea. Perhaps it is the tea patina from constant using of a teapot, that had improved the taste of the tea. Maybe, the teapot holds the temperature well (preventing the tea from cooling too fast)...or maybe it is the interaction of the clay with the tea. (Incidentally, I also found that purion teapots made by Lin Ceramics seem to make my pu erh tea more amplified in the aroma and taste.) Buying a Yixing teapot may be an expensive proposition. You would be looking at prices from $50-200 for a Yixing teapot. But....if you are careful with it, the teapot can give you many happy brews of your tea. I have a few teapots that I have used and brewed tea for more than a thousand times. 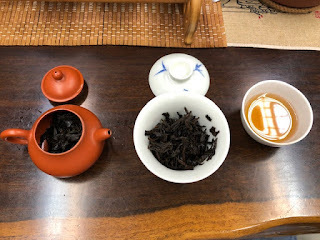 I had personally found, I could use a Yixing teapot to brew either ripe or raw tea and I could not discern any inconsistency in the tea when I used such a teapot. I recently read an article that using a teapot is not 100% necessary and that using a gaiwan is good enough. You can brew a tea anyway you want even throwing some leaves in a cup, adding hot water and drinking the tea later, but to enhance the atmosphere of drinking and appreciating Chinese tea, a teapot is an important utensil that serious tea drinkers cannot do without.